The Routledge Handbook of Political Ecology presents a comprehensive and authoritative examination of the rapidly growing field of political ecology. Located at the intersection of geography, anthropology, sociology, and environmental history, political ecology is one of the most vibrant and conceptually diverse fields of inquiry into nature-society relations within the social sciences. The Handbook serves as an essential guide to this rapidly evolving intellectual landscape. With contributions from over 50 leading authors, the Handbook presents a systematic overview of political ecology’s origins, practices and core concerns, and aims to advance both ongoing and emerging debates. While there are numerous edited volumes, textbooks, and monographs under the heading ‘political ecology,’ these have tended to be relatively narrow in scope, either as collections of empirically based (mostly case study) research on a given theme, or broad overviews of the field aimed at undergraduate audiences. 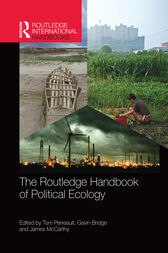 The Routledge Handbook of Political Ecology is the first systematic, comprehensive overview of the field. With authors from North and South America, Europe, Australia and elsewhere, the Handbook of Political Ecology provides a state of the art examination of political ecology; addresses ongoing and emerging debates in this rapidly evolving field; and charts new agendas for research, policy, and activism. The Routledge Handbook of Political Ecology introduces political ecology as an interdisciplinary academic field. By presenting a ‘state of the art’ examination of the field, it will serve as an invaluable resource for students and scholars. It not only critically reviews the key debates in the field, but develops them. The Handbook will serve as an excellent resource for graduate and advanced undergraduate teaching, and is a key reference text for geographers, anthropologists, sociologists, environmental historians, and others working in and around political ecology. Tom Perreault is Professor of Geography at Syracuse University, USA. His research focuses on resource governance (particularly water and mining), agrarian change, indigenous social movement politics, and rural development in the central Andean region. Gavin Bridge is Professor of Economic Geography at Durham University, UK. His research focuses on the political economy of extractive industries and how firms, states, and raw materials shape the political ecologies of oil, gas, and mining. James McCarthy is Professor in the Graduate School of Geography at Clark University, USA. His research centers on the intersections of political economy and environmental politics, with particular emphases on the relationships between neoliberalism and environmental governance, and on rural areas and industries.